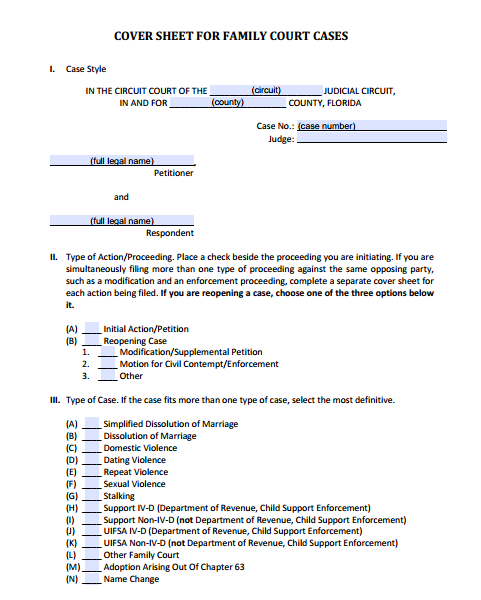 PDF Fillable Form 12.928 Cover Sheet for Family Court Cases. This form shall be filed by the petitioner/party opening or reopening a case for the use of the clerk of the circuit court for the purpose of reporting judicial workload data pursuant to Florida Statutes section 25.075. The petitioner must file this cover sheet with the first pleading or motion filed to open or reopen a case in all domestic and juvenile cases.